The VW is one of the most iconic vehicles on the roads of Toms River, Brick, and Freehold today. With a sleek appearance, top-of-the-line features, and a performance that will elevate any drive, it makes a fine addition to most lifestyles. However, if you’re in the market for a Volkswagen Jetta, how do you know whether a new or used model is right for you? At Toms River VW, we give the best of both worlds with our Certified Pre-Owned options. Combining benefits from buying new and used, it’s the perfect choice for anyone in that conundrum. And, with our Certified Pre-Owned Volkswagen Jetta review, you can learn more about CPOs, as well as this wonderful vehicle. Contact us today to schedule a test drive! What is a Volkswagen CPO? Simply put, a certified pre-owned Volkswagen is a type of used car. But unlike traditional pre-owned vehicles, these go through rigorous tests to earn such a title. Volkswagen CPOs must pass a 100+ point inspection to ensure it is nearly new. This includes assessing everything under the hood to make sure it’s in tip-top condition, as well as a road test to check for steering, noise, vibration, and everything in-between. As the sedan with the power, the VW Jetta is sure to transform any driving experience into one that is thrilling, entertaining, and safe. Under the hood, you’ll find the impressive turbocharged engine that not only gives you a great amount of vigor on the road, but it also stays fuel-efficient, as well. And, when it is paired with the available Driving Mode Selector, you can choose your style from Eco, Sport, Normal, and Custom modes to suit where you’re headed. Volkswagen is known for safety and inside of the VW Jetta, you’ll find a suite of technology that is designed to keep you and your passengers more secure. From state-of-the-art safety cage and an intelligent crash response system to innovative driving assistive tech, you can gain more peace of mind when behind the wheel. The technology is also impressive inside of the sedan, sure to add an element of connectivity and entertainment to all your commutes. The infotainment system included lets you access your important information, like music, navigation, and phone calls seamlessly, while the groundbreaking sound system creates a music atmosphere like no other. Along with the ability to drive a fully equipped vehicle, certified pre-owned Volkswagen models give you a load of perks that other used models cannot—one of the most exciting being the limited warranty coverage. 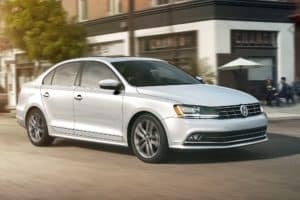 Depending on your year of Volkswagen Jetta, you will receive either a two-year or 24,000-mile warranty, coverage for one year or 12,000 miles, or two years and unlimited miles with their comprehensive limited warranty. Additionally, all certified pre-owned Volkswagen Jetta models come with a CARFAX® Vehicle History Report, so you can know exactly what your vehicle has been through. 24-hour roadside assistance is another CPO perk, which includes towing services, emergency door unlocking, jump starts, and much more. Finally, you can enjoy a three-month trial subscription to SiriusXM® All-Access satellite radio. With over 150 channels to choose from, you’ll never find yourself bored while driving again, Plus, you can even use this service in your home! Find Your Certified Pre-Owned Volkswagen Jetta Today! Now that you have discovered all the benefits available in our certified pre-owned Volkswagen Jetta review, you’re ready to get behind the wheel. To schedule a test drive or learn more about our CPO program, contact Toms River VW today! We proudly serve drivers in Toms River, Brick, Freehold, and the nearby areas. Visit our certified pre-owned Volkswagen dealer near you to get started.